Royal wedding fever is officially upon us. After Harry announced his engagement to Meghan Markle yesterday, their photocall and BBC interview were conducted in what felt as frenzied as their whirlwind 16-month courtship. 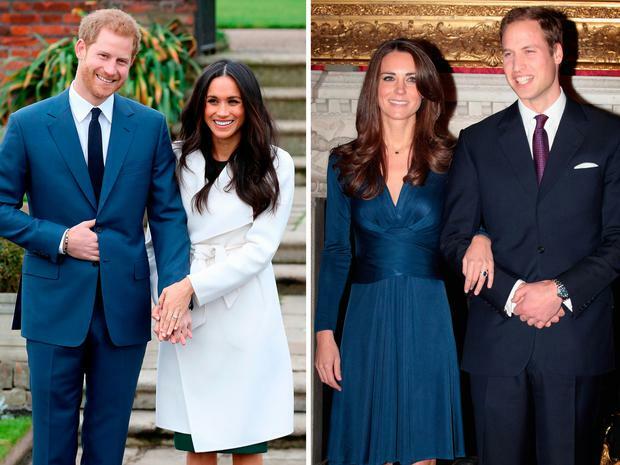 Unlike his older brother Prince William's big announcement with Kate Middleton seven years earlier, it was a rather relaxed affair, the kind that comes with the lack of pressure in being bumped to fifth in line to the throne. While Kate’s every move was documented by the British press, it was her first interview and despite doing her best to mask them, it’s clear she was nervous. She would often stop mid-sentence, with William picking up to illustrate her point as she eased her way into public life. Meghan, on the other hand, has been on countless auditions and given a number of speeches with her role as a United Nations Women’s ambassador, so public speaking is a cinch for her – and it showed. She’s also eight years older than Kate was at the time and has the maturity to grasp the situation and articulate her point. William chose ITV’s Tom Bradby for the bit sit-down, an old friend of the royal - a major coup for the network as it would have been expected to go to the BBC, which Harry did. Bradby was already acquainted with William when he was the impetus behind an investigation into the News of The World phone hacking scandal; after seeing a note in the news diary that only he and three others knew about, according to The Guardian. Prince William's press secretary, Miguel Head, in a press note to media organisations, said: "The couple asked to record this interview specifically with Mr Bradby, whom they have both known for some time." Similarly, Harry and Meghan chose the BBC's Mishal Husain for the interview, for which she has been praised. William and Kate chose the State Apartments of St. James Palace, a rather grander setting: they posed for photographers in front of a marble fireplace and gold trim. As second in line to the throne, a more traditional display of stateliness was expected. Meghan and Harry, on the other hand, arrived hand in hand to The Sunken Garden, also known as the White Garden, among the grounds of Kensington Palace. The area was dedicated to the memory of Princess Diana, and it was the first of many references to the late princess throughout the day. William and Kate’s interview wasn’t exactly filled with PDAs – throughout the 20 minutes, they occasionally pat each other’s legs, but by and large, it was much more reserved than Meghan and Harry, who spent most of their time on the couch gazing into one another’s eyes and gripping each other’s hands. Like his older brother, there were lots of laughs and ‘in’ couple jokes – with William and Kate, it centred around his poor cooking skills and with Harry and Meghan, it was about Queen Elizabeth's corgis falling for her instantly (same). The 'Meghan effect' is officially in season – her sleeveless green dress by Parosh was an instant-sell out, while her white wrap coat by The Line crashed the brand's website earlier in the day. In contrast, Kate’s navy Issa wrap dress hinted at the sort of stylish conservativism we've come to expect from her, paired with her trademark flesh coloured tights. Both fiancées were determined to introduce their partners as hopeless romantics, sharing some insight into the men behind the crown. “It’s very romantic, there’s a true romantic in there,” Kate gushed over William, when asked about his proposal. FYI: While on a trip to Kenya with friends, he proposed at the top of a mountain and she instantly said yes. Although it wasn’t love at first sight (Kate said she “scuttled off” blushing when she first met the prince), there was friendship at the beginning, which eventually turned to more. Similarly, Meghan says her fiancé is an old romantic, admitting he got down on bended knee while they were roasting a chicken at Nottingham Cottage. And the real reason he waited eight years to pop the question was to do with their still relatively young age and also giving her the opportunity to end things and choose a life outside the royal fishbowl. “That’s also part of why I wanted to wait this long, I wanted to give her enough time to see and back out if she needed to before it all got too much. I just wanted to give her the best chance to settle in,” he explained. Harry and Meghan, on the other hand, seemed to be jump in head first and announced their plans to wed just 16 months into their relationship, but the American actress believes those first six months when their romance is one of the secrets to their long-lasting love. “I don't think that I would call it a whirlwind in terms of our relationship, obviously there have been layers attached to how public it has become after we had a good five, six months almost with just privacy, which was amazing. "I think we were able to really have so much time just to connect and we never went longer than two weeks without seeing each other, even though we were obviously doing a long distance relationship. So it's - we made it work,” Meghan says. Both princes were clearly concerned for the wellbeing of their other halves, while also thrilled to find someone able to cope with the pressures and responsibilities of royal life. “It’s about carving your own future – no one is trying to fill my mother’s shoes and what she did was fantastic, but it’s about making your own future and your own destiny and Kate will do a very good job of that,” William said. Harry actually inherited the sapphire and diamond ring adorning Kate’s finger, but he wanted his older brother to have it when he proposed in 2010; although this wasn’t known publicly until earlier this year when speculation about a Prince Harry-Meghan Markle engagement began reaching a frenzy. “I thought it was quite nice because obviously she’s not going to be around to share any of the fun and excitement of all this, this is my way of keeping close to it all,” William said of giving Kate the ring. Meghan said she was honoured to have two stones from Diana’s personal jewellery collection adorn her bespoke ring. "I think everything about Harry's thoughtfulness is - and the inclusion of that and obviously not being able to meet his mom it's so important to me to - to know that she's a part of this with us." Harry, on the other hand, believes that Meghan and his late mother would have been “thick as thieves”. “II think she would be over the moon, jumping up and down, you know so excited for me, but then, as I said, would have probably been best friends - best friends with Meghan," he said. "So no it's - you know it is days like - days like today when - when I really miss having her around and miss being able to share the happy news. But you know with the ring and with everything else that's going on I'm sure she's…"
This is where Meghan interrupts him to say, “She’s with us.” And the world collectively shed a little tear. Is Meghan ready for her toughest role yet?